Jan Vanriet is a hugely influential painter and poet from Belgium. He has exhibited widely across the world, representing his country in the biennials of São Paulo, Venice and Seoul yet this is his first exhibition in the UK. Much of his work is rooted in his family history. His parents met in the Mauthausen concentration camp and their stories and memories of the Second World War and its aftermath continues to influence his paintings. Themes of love, loss, identity, destiny and disappearance pervade his work. Yet there is also an inherent playfulness and lightness of touch and an evident mastery of the medium of paint. 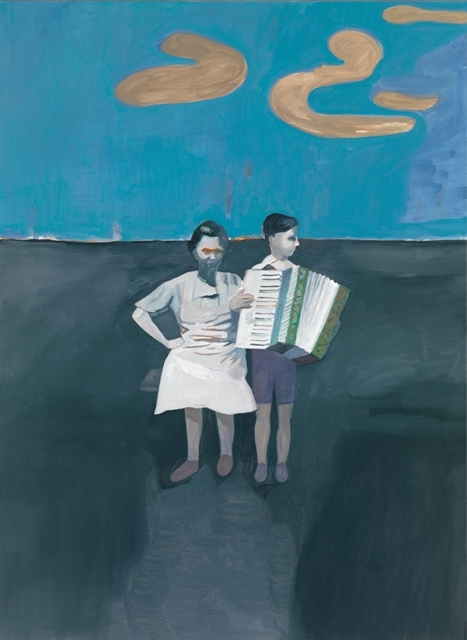 The Music Boy is a polyptych of four paintings depicting his grandmother and uncle – his mother’s twin brother – playing accordian as a boy before the war. Jan Vanriet was born in Antwerp, Belgium in 1948. He lives and works in Antwerp. 168 pages, 72 illustrations, hardcover. Image credit: Jan Vanriet, The Music Boy, Black, 2013, Courtesy of the artist and Roberto Polo Gallery, Brussels.